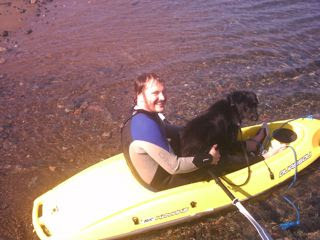 I wish to wholeheartedly recommend the Bic Ouassou sit-on-top kayak. 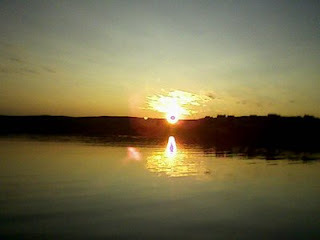 So far this year, I have been out on the water more than in the past five years put together. It's stable, safe, robust (rotary-moulded polythene) and above all, easy to use.No faffing about with bad outboards and heavy, leaky boats. And it was cheap too. 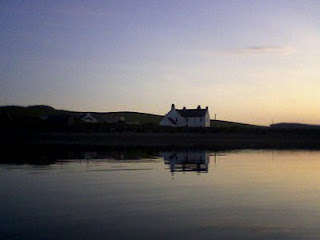 Anyway, out tonight from about 21.40 until 22.30, on a night so calm you could see the sandeels' ripples. And so could the tirricks, who came plummeting down like mini-gannets, hitting the water like aerial torpedoes. 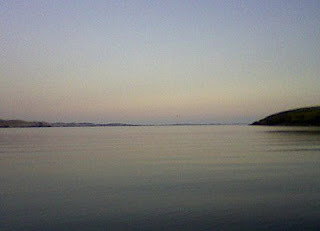 St Magnus' Bay was ridiculously still. Sitting in the kayak was like sitting on a rock. And, to quote The Other Bruce (Cockburn) the sun went down, looking like the eye of God. By the way, these photos were taken on a fairly basic phone, a Samsung Solid. Which I can say without fear of contradiction, is splashproof. Not to say immersion proof. On a night like this, one's thoughts in Shetland turn, inevitably (and in our case with considerable guilt) to the peat hill. 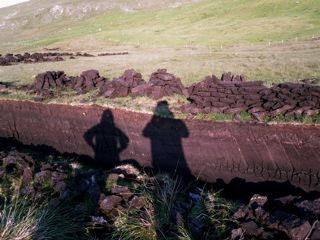 Three banks cut (not by us - our friend Lornie did the heavy tushker work), half-raised (by us, slowly) and drying out so fast in this weather that nearly everyone else has their peats bagged and home. It's back-breaking toil, with only a few minutes' winter fuel in every single turf turned. But with the new Haas und Sohn stove, and the price of oil...we're not alone in making a commitment to local carbon fuels this summer. And before you make accusations of profligate carbon abuse, remember this is (in Shetland's case) a local (a mile away) fuel and in almost infinite supply if not extracted commercially. This is The Gaslight Anthem's best song, and it has to be said that Bruce adds not very much to it other than his charisma, dodgy backing vocals and a very competent guitar break. Hell, that's enough! In terms of anointing the inheritors, it's surely significant. And thrilling for all concerned. See it here. 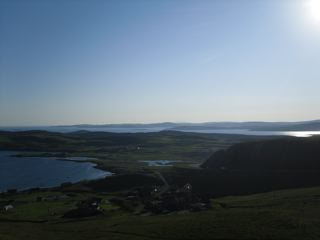 Fantastic, almost unprecedented weather in Shetland. Too hot to go out yesterday! Today was the Mavis Grind Foy...where else can you get a seafood platter (skate, smoked mackerel, mussels and fresh salmon) for £4? Mavis Grind is a narrow isthmus where the North Sea meets the Atlantic. 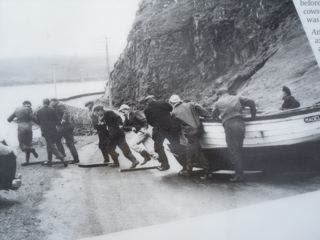 From Viking times until the 1950s, it was used as a short cut, with boats being dragged over the land from sea to sea in order to avoid the sometimes ferocious conditions around the northernmost part of North Roe. 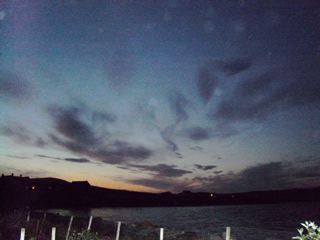 The pictures include a view over South Whiteness on Shetland's west side, and a shot of the sky taken at 12.45am today from our house. ...by Lesley McDowell. I suppose it was inevitable that Serpentine would be coupled with Alan Clements' Rogue Nation (same publisher, both authors working in the Scottish media, although I'm not the zillionaire boss of STV.) Fair points made, I think, though obviously as a writer you don't really want intelligent objectivity, you want TOTAL AND BREATHLESS ENTHUSIASM. Which only goes to show what a sheltered life Ms McDowell has led. It must be said that both Rogue Nation and Serpentine are treated with the same unwillingness to suspend disbelief. Ah well. Meanwhile, I received an email this week from a woman who'd bought the book for her husband who, she said "had not read a book in 30 years." At the end of the first chapter he apparently said "this is hopeful" and proceeded to finish it in double quick time. Result! Heavily edited by a young Chris Morris, BBC Radio Three's Why Bother? interviews between Morris and Peter Cook (as Sir Arthur Streeb-Greebling) were the last flowering of Cook's immense talent, teased and prodded by the enfant terrible of modern British comedy. Without Morris (and especially the astonishing Blue Jam) no Little Britain, no Day Today, no Alan Partridge, no Office, no Thick of It, and especially no League of bloody Gentlemen. As for Cook, without him there would no modern mediated comedy as we know it. All the Why Bother? interviews are on YouTube, but check this out to hear Cook's old, lazily massive intellect turning over wonderfully but balefully as Morris tries to throw various spanners in his mental works. Stunning. "Bloody...bloody...bloody eels!" "She was born with legs only three inches long, but her parents were determined to have film-star-style daughter..."
Sent to the show yesterday by Colin Bell. Absolutely on the money, I think. hash or some sort of dry nuggets. to disgust them, I once again vomit on the carpet. condescending comments about what a 'good little hunter' I am. Bastards. means and how to use it to my advantage. again tomorrow -- but at the top of the stairs. he is safe. For now .. The band Drive By Truckers has always kind of passed me by...occasional exposure to singles in the line of work left me without any kind of desire to find out more, despite the fantastic Muscle Shoals family heritage of the band. Former Trucker Jason Isbell has a new album out, though, with his touring band The 400 Unit, and as it arrived on my desk in a brief interlude between deluges of dodginess, I gave it a listen. Then I played it in the car. Three times. Recorded at the legendary Fame studios in Isbell's home town, Muscle Shoals Alabama, it's a real country soul/rock beauty. Somewhere along the line starting with Otis Redding, and passing straight through Frankie Miller, Rod Stewart and the Allmans. Great writing. It's been sitting untouched for three months, but the Suzuki GS1000G (shaft drive: I fear chains)complete with new, self-fitted exhaust system, burst into lumpy life quite the thing this afternoon. In the 1980s, this would have been a great big huge monster of a muscle bike; now it feels, compared the the Triumph Trophy, like a BSA Bantam, with its square-section tyres and see-through chassis. But you can't beat an 80s parallel Japanese four for noise. Nicer than a v-twin any day of the week. It's been painstakingly restored, the Suzie, with really wide hooligan bars, so I swept down to Brae for the papers feeling like I was on a wee Harley with proper brakes. Shetland is alive with bikes this weekend, as it's the annual Simmer Dim Rally. Lots of waving. The Fellowship of the Road! It was time to carry out an audit of the Big Red Bathtub and decide what to do with the Triumph 1200. First job was to clean it, and then remove all the duct tape which had been used on the Journey's Blend trip to secure wobbly light lenses and mirrors. Some deft dodging with a screwdriver and everything was solid again. The main theft damage - broken seat lock and smashed side panel - remains. Dave D suggested leaving the taped-up panel as it is, in order to deter would-be thieves. In fact, it loks OK. The seat's another matter. The catch is pop-rivetted on and impossible to replace. Annoying, as the previous owner had the seat recovered. Sell it? That was my half-intention when I got the thing, once the 1000-miles around Scotland had been completed. But the Trophy is a truly fantastic looking bike, and beneath its dodgy Alfa Romeo respray and broken bodywork it's a really reliable express train, an old school continental cruiser, serviced, with only 29,000 miles on the clock. Nope. I'll think about Guzzis another year, if I'm spared. The Triumph is clean, happy and handsome and I'll hit eBay for some bits to fix it up. The Suzuki is too lovely to part with. And now...back to the shed with you both! My two hours at The Shetland Times was pleasant, as various folk I know and don't know bought books and chatted. Interestingly for the theme of Serpentine, it was Armed Foces Day, and a military band was marching outside, providing a suitably brassy soundtrack to Murricane and Flaws' torrid adventures. But not everyone wants a signed book, and not everyone who wants one wants to actually meet the author. I had a pile of advance requests to sign, and a number of my friends locally had already bought the book and had no desire to see me deface it. They just wanted to read it. Linda Glanville was in the Peerie shop Cafe, and had bought a copy of Serpentine when it first came out. No signature necessary. She's one of the biggest crime thriller aficianada I've ever met, and to whom I will be forever grateful for, a few years ago, lending me copies of the then-rare Maj Sjowall and Per Wahloo Beck books. Not only did she enjoy Serpentine, she was even able to read the violent bits she normally avoids in other such tomes. "Except the bit about the seagulls." There's a Flickr set of photos here, should you wish to investigate further the mysteries of Ken's moustache and other matters. Truly wonderful Radio Four documentary today on the legendary, subterranean-voiced Bill Mitchell, the voiceover artist behind Denim aftershave, and (after Orson Welles pulled out) Carlsberg. Also a great picture of bohemian Soho in the 60s. You've got seven days to listen to it here. Probably. I've known for several months that a major on-air discussion about the proposed Viking Energy windfarm project in Shetland was likely to take place on the BBC local radio station, Radio Shetland, and that I'd be hosting it. So I've been extremely careful to avoid making any public comment on the issue. Feelings have been running high. As, until a week on Monday, you can hear for yourself. 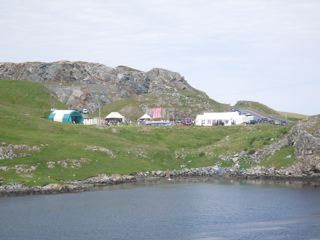 The anti-windfarm group Sustainable Shetland has mounted a high profile campaign against the project. There have been accusations of bullying tactics by both sides, and some regrettably vituperative comments have been made, orally and in the press. Friends have fallen out, families have been split. 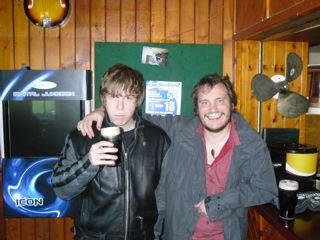 So this was going to be no ordinary 'Speakeasy'. For one thing, it was going to be two hours long, and broadcast in summer, after Radio Shetland's 'late' programmes had stopped for the season. I was happy to host the programme, though there are issues with the format of Speakeasy which are problematic: No live calls are put through on air; people call in their comments or questions, or email and they are usually anonymous on air, although names are normally given at initial contact. There is, as always, a risk of systematic, pre-planned lobbying, and it's probable this happened on Monday night. Anyway. By the time we went on air at 6.10pm, we had been deluged with calls and emails, the vast majority opposing the development. SS have delivered an anti-wind farm petition with 3000 signatures, and are extremely well organised. They were represented in the Lerwick studio by Billy Fox and Kevin Learmonth; on the other side of the table were councillors, charitable trustees, and directors of Viking Energy Alan Wishart and Bill Manson. MP Alistair Carmichael and MSP Tavish Scott also contributed live via ISDN line and by phone. 1: Conflict of interest. The council is the planning authority but has a half-share in the development. Shetland's oil funds, administered by the Charitable Trust, are being ploughed into the project. Bill, Alan and other councillors are accused of being hopelessly compromised in their decision making. 2: The environmental and aesthetic impact of the development: It is huge - 150 turbines, each 145 metres tall. That's right. Metres. Roads will be built, quarries dug, power sub-stations constructed. 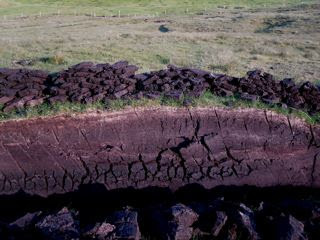 Vast amounts of peat will be shifted, thus, SS argue, fatally compromising the so-called carbon benefit of the project. 3: The financial issues: How much will it cost and will Shetland as a community benefit, or lose out? The council and Charitable Trust has a bad record of investment in other supposedly profitable projects. The main problem with the programme, as far as I was concerned, was reflecting the huge number of public contributions, which came in throughout the show. I believe the overall make-up was accurately provided, though it was impossible to read out everything, and most emails were very lengthy. 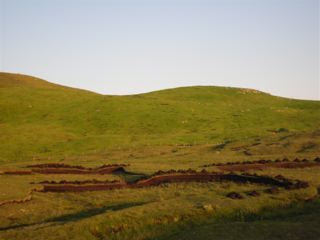 The impact on Shetland's landscape was a recurring theme. Though outweighed by opposition, there were some significant arguments for the project going ahead. The in-studio confrontations were sometimes fraught. It was clear that while the councillors were used to forthright opposition and were prepared to deal with it, the two SS campaigners did not take kindly to having their positions challenged publicly, either by the councillors (Alan was on particularly sarcastic form)or,in a devil's advocate fashion, by me. Billy Fox grew particularly agitated after I cut short his quoting at length from a document, and I was accused of not allowing him to speak. I then made it clear that all participants should feel free to speak, and that they did not need to be asked by me. But the mood was clouded. We had one 'vox pop' insert from the streets of Lerwick and four other, balanced sets of interviews from around the isles. By the end, I felt most of the issues had been raised and the faults in arguments on both sides exposed. I don't think the studio guests parted on particularly friendly terms, but hey, that's showbiz. 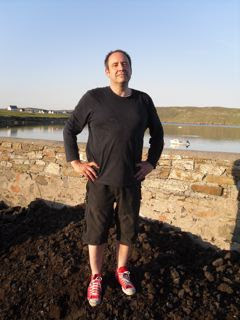 Since the broadcast, there have been, I think, four complaints to BBC Radio Shetland about the debate, all centring on the way it was conducted by me, all alleging bias against SS. I do not know who these complaints came from. All but one are highly personal and very bitter. Commensurate, I fear, with the tone of many anti-windfarm letters to the local paper. I remain unwilling to take any public position on the wind farm issue. There are good arguments on both sides. Monday's programme was an attempt to highlight those arguments. And you can judge for yourself (until next Monday) whether they were made, and made well and fairly, here. Ahem...It’s the biggest issue facing Shetland, and tonight, for two hours, live, the main players for and against Viking Energy are available to you for questions and comment. Trembling Bells - resistance is futile! Lavinia Blackwall has played previously with Alex in Directing Hand and is a member of the The Pedulums. Not to everyone's taste, perhaps...seeing as I've just been instructed to turn this down so the women in the household can watch Britain's Next Top Model...anyway...I think they could be a Scottish Arcade Fire if they wanted to. Which I surmise they don't. Many thanks to Shetland Times reporter Laura Friedlander for a lengthy and enthusiastic review which reflects almost exactly my wife's opinion of the book. Can't, alas, find it online so you'll have to trust my ability to extract the most flattering bits! I found the very fast pace of the book challenging, but it made me re-read passages to make sure I had not missed out. I would even go so far as to say it is a book perhaps worth reading twice as rather like a painting, more details come out on second examination. It is not the sort of book you can read last thing at night and it certainly won't lull you to sleep through boredom, because the book is a page-turner, no doubt about that. It could give you nightmares. Hold on tight for a real rollercoaster read...this is real boy's own stuff. If you want to read a really macho adventure story, then this might just be this summer's top read in the genre. I'll be signing copies of the book (and hopefully people will be buying them)between noon and 2.00pm on Saturday 20th June at The Shetland Times Bookshop in Commercial Street, Lerwick. The book, the magazine article, the TV show and much else to follow. I'm back on the radio tomorrow, all being well. A few snapshots: The Kilchoman cross on Islay, and the very first cask of Kilchoman whisky - now, at more than three years old, legally Scotch whisky. The bikes, first at 6.15am waiting for the ferry from Port Askaig to Kennacraig, and then including a yellow interloper, Dave's Triumph Sprint, outside Bladnoch Distillery at Wigtown. Finally, that's an incredibly rare, restored BSA Gold Star racer, used at Daytona in the 1950s, and on display at the Scottish Classic Motorcycle Show, which I was delighted to declare open today. In the Broxden McDonalds outside Perth. First internet for three days. That's 620 miles, and now heading (alone - others had a long lie) for Glen Garioch at Oldmeldrum. Big Red Bathtub behaving very well. I left the - truly excellent - Bladnoch Inn at 7.00am as I was booked to open the Scottish Classic Motorcycle show in Fenwick. Made it up the lovely New Galloway road in an hour and a half. Then thrashed it north in dry but dull weather because I knew there was free wi-fi at McDs...how sad is that? The other bikes are doing well, but poor Ken Hamilton on the Enfield is having to put up with serious discomfort and lack of speed. The (2009, unit construction) Enfield looks lovely, though. Rob on the Triumph has all the benefits of classic design and modern tech. Kilchoman on Islay was very interesting, and Bladnoch fantastic...never had a tasting session like that before. Just the most easterly distillery left now, and the actual blending. Must go. This is a fast food place, after all. Got some great pix and will blog later if there's wi-fi at the b&b. It's 100 miles exactly from Glasgow to Fort Bill. I'd done 105 by the time I'd found my b&b, tucked away behind the town. I set out from Glasgow under grey skies, but by the time I hit Tyndrum (my usual pilgrimage to the Green Welly Stop) the sun was out. Fort William is HOT, and Glencoe, which I'm used to seeing in winter, under thundery, emotional clouds or in slashing rain, was baking hot. Loads of camper vans and would-be Jeremy Clarksons in SLK Roadsters. The old Triumph behaved immaculately, displaying just how 1200cc can overtake...almost anything, anywhere, if you can cope with the fear. 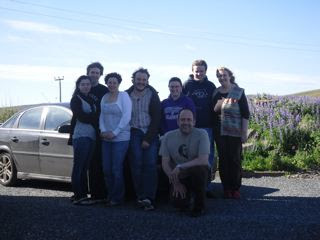 Heard from Ron et al, safely at Glenmorangie and heading off for Lochaber. I believe they have a satnav, so they might have better luck finding the b&b...tomorrow, it's a belt down through Oban to Kennacraig, and Islay. My new thriller Serpentine is officially published today...find out more and follow the links to buy a copy at the Serpentine Blog. 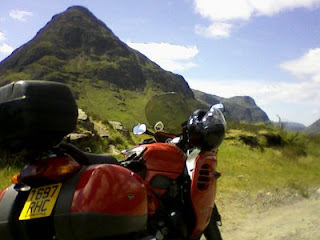 And today I head off to meet up with the other guys involved in the Journey's Blend charity whisky motorbike jaunt. Fort William tonight, Islay tomorrow, Bladnoch on Saturday, Glengarioch on Sunday, Crieff Monday. If you're in the vicinity, keep an eye out for a big, battered old Triumph Trophy 1200 (red) which sounds like a diesel truck. Also a brand new Triumph Bonneville and an Enfield 500. Plus TV crew. Hell's teeth, now we're jailing Canadians for being singer-songwriters! Allison Crowe and her Canadian bandmates, (guitarist Billie Woods and percussionist Laurent Boucher, reunited with their British-passport-carrying bassist Dave Baird), have now performed two sensational concerts in Germany - in the cities of Aachen and Munich. Following a national holiday weekend the tour carries on now to Frankfurt, Berlin, Prague and Vienna. In the UK, where the Canadian musicians were barred from entry last month, national debate over new anti-terrorist/illegal immigration laws that target artists and academics visiting from non-EU countries continues to build. Concern is reflected in coverage from the northern tip of the British Isles, via such journals as The Northern Times and The Aberdeen Press & Journal, to the southern region, and such London-based newspapers as The Telegraph and The Observer/Guardian. The Scotsman reports that “John Thurso, the Liberal Democrat MP for Caithness, Sutherland and Easter Ross, added: 'The rule itself is an affront to the great British tradition of welcoming overseas artists and another example of this government's unyielding zeal for mindless regulation.” Thurso told Scotland's national newspaper: "Security is important, but throwing international performers into a lock-up and being rude to them should be no part of it." “We fondly think of ourselves as hospitable and open to new influences. But on the evidence of new laws that ban artists, musicians and academics from visiting Britain without certificates of sponsorship, we are not. When a Newfoundland-based singer Allison Crowe and two of her band members, Billie Woods and Laurent Boucher, arrived at Gatwick to tour Britain they were arrested, held in cells, photographed and fingerprinted and had their passports stamped 'Barred from Entry' before being returned to Canada. This shocking and disgraceful treatment - designed to exclude illegal immigrants and terrorists - seems fundamentally unBritish. The English National Opera and Southbank have both had problems bringing in foreign performers because of the stringent requirement for non-EU citizens to provide biometrics and photographs and submit to controls over their day-to-day activity while here. The Visiting Artists and Academics Petition ~ found @ http://www.petitiononline.com/MCvisit/petition.html ~ was launched earlier this year by the UK civil liberties group, the Manifesto Club, with the endorsement of: renowned sculptor Antony Gormley; director of the National Portrait Gallery, Sandy Nairne; the artistic director of the Royal National Theatre Nicholas Hytner and dozens more concerned artists and educators. Our approach to music is very much grassroots, community-oriented. We've learned that many people in this segment of the UK's cultural industries were neither consulted nor informed of the "Certificate of Sponsorship" laws. Of those that were, there's a range of opinion. If there is any silver lining to our experience, it's the hope that we can, in some small measure, contribute to there being greater awareness, even reform, and, at least, some greater measure of reason and good judgement applied in the application of any rules. .and all kudos to the GENUINE paramedics, for whom no praise is too great...a wee ditty from Blind Boy Flugga. Based on real events. Allegedly. Some great weather hallmarked the visit to Shetland of my eldest son Sandy and his wife Elaine (and their husky-labrador cross Cuillin, who has an affection for hens) and later in the week Magnus and Laura. All this and James's 18th birthday too. 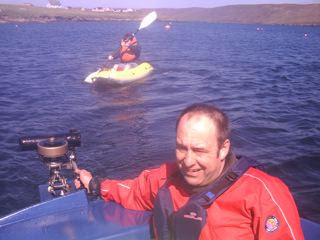 Friday saw a lot of messing about on the water, mostly to enjoyable effect. The dinghy Cryptonomicon, however, proved somewhat unequal to the task of carting folk about; I'd forgotten how inherently unstable sailing dinghies are. 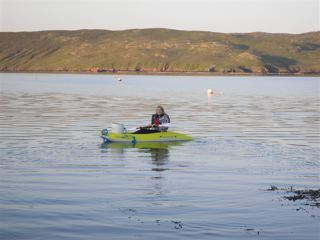 And when the much-vaunted British Seagull 40-Plus motor failed, it proved impossible to get the boat back onto her mooring, paddling against a strong wind. So it was out of the water, onto the trailer and, I fear, into the classified ads with her. A bigger, more stable boat is needed. I'm off on the boat tonight to pick up the motorbike and begin the Journey's Blend trip on Thursday. I'm somewhat nervous, but looking forward to it.